In this lesson, we will learn how to use the formula E = mcΔθ to calculate the amount of energy needed to increase the temperature of a material or object by a given amount. 4 1 8 4 J of energy is needed to heat 1 kg of water by 1 ∘ C , but only 140 J is needed to heat 1 kg of mercury by 1 ∘ C . Which material has the higher specific heat capacity? A block of steel and a block of asphalt concrete are left in direct sunlight. Assuming that both materials start at 1 5 ∘ C and both absorb energy from sunlight equally well, determine which material will reach a temperature of 2 0 ∘ C first. Use a value of 5 1 0 / ⋅ J k g C ∘ for the specific heat capacity of steel and use a value of 9 1 0 / ⋅ J k g C ∘ for the specific heat capacity of asphalt. The graph shows the change in the internal energy against the change in the temperature for three 0.1 kg blocks of metal. The orange line represents a block of tungsten, the green line represents a block of iron, and the blue line represents a block of nickel. Which of the 3 metals has the highest specific heat capacity? Which of the 3 metals has the lowest specific heat capacity? If all 3 metal blocks start at 2 0 ∘ C and 1 2 0 0 J of heat is transferred to each block, which blocks will be hotter than 4 5 ∘ C ? Which of the following is the correct formula for the increase in the internal energy of a material when the temperature of the material is increased? Δ 𝐸 represents the change in the internal energy of the material, 𝑚 represents the mass of the material, 𝑐 represents the specific heat capacity of the material, and Δ 𝜃 represents the change in the temperature of the material. A cube of copper with sides of length 5 cm, is heated by 1 ∘ C , taking 431.2 J of energy. Find the density of copper. Use a value of 3 8 5 / ⋅ J k g C ∘ for the specific heat capacity of copper. Give your answer to 3 significant figures. Determine how much energy is needed to heat 2 kg of water by 3 ∘ C . Use a value of 4 , 1 8 4 / ⋅ J k g C ∘ for the specific heat capacity of water. Give your answer to 2 significant figures. 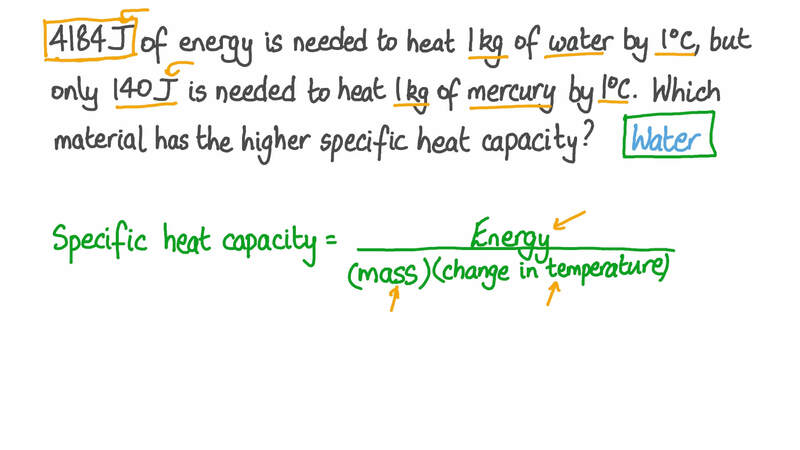 Which of the following is the correct definition of specific heat capacity? AIt is the energy needed to increase the temperature of 1 kg of a substance by 1 ∘ C .
BIts is the energy needed to increase the pressure of 1 g of a substance by 1 atmospheric pressure. CIt is the energy needed to completely evaporate a substance. DIt is the energy released by burning a substance. EIt is the energy needed to completely melt a substance. Asphalt concrete is used to surface roads. When under direct sunlight for a long time, it can get very hot. If 2 5 0 0 kg of asphalt increases in temperature from 1 8 ∘ C to 4 0 ∘ C , absorbing 50 MJ of energy from sunlight, what is the specific heat capacity of asphalt concrete? Give your answer to 2 significant figures. A mercury thermometer uses the fact that mercury expands as it gets hotter to measure temperature. A mercury thermometer contains about 0.5 g of mercury. If 0.28 J of energy is transferred to the mercury from the surrounding environment and the temperature shown on the thermometer increases from 1 8 ∘ C to 2 2 ∘ C , what is the specific heat capacity of mercury? A student measures the temperature of a 0.2 kg block of platinum and the change in its internal energy as it is heated. The results are shown in the graph. Use the values in the graph to calculate the specific heat capacity of platinum. Give your answer to 3 significant figures. A steel cube has sides of length 4 cm. The cube is heated, increasing its temperature by 3 ∘ C . Find the energy required to heat the cube. Use a value of 8 0 0 0 kg/m3 for the density of steel and use a value of 5 1 0 / ⋅ J k g C ∘ for the specific heat capacity of steel. Give your answer to 3 significant figures. A hot water tap in a house is turned on, and hot water flows along a 250 g copper pipe that is initially at 1 9 ∘ C . 4.5 kJ of energy is transferred to the pipe. Find the temperature of the pipe after the energy has been transferred to it. Use a value of 3 8 6 / ⋅ J k g C ∘ for the specific heat capacity of copper. Round your answer to the nearest degree Celsius. A car is left in direct sunlight all day. The sunlight heats the roof of the car, transferring 15 kJ of energy to it. The roof is made of steel and has a mass of 12 kg. Assuming that the roof does not lose any of the heat that it gains, find how much does the temperature of the roof increases. Use a value of 5 1 0 / ⋅ J k g C ∘ for the specific heat capacity of steel. A small reservoir contains 1 0 0 0 0 kg of water. During the day, the peak temperature of the water is 2 2 ∘ C . At night, this drops to 1 4 ∘ C . Find how many megajoules of energy the reservoir loses to its environment between the day and the night. Use a value of 4 1 8 4 / ⋅ J k g C ∘ for the specific heat capacity of water. Give your answer to 3 significant figures. A 1.7-liter kettle is used to heat 1 kg of water from 1 9 ∘ C to 1 0 0 ∘ C . Find the energy in kilojoules needed by the kettle to do this. Use a value of 4 1 8 4 / ⋅ J k g C ∘ for the specific heat capacity of water. Give your answer to 3 significant figures.